Maureen, those are marvelous stamps and I really love how you've used them. Beautiful card! Absolutely breathtaking! Love the colors together, the images, the ribbon - everything! :) Love your idea of starting your days stamping this summer. I may try that too. Oh this is stunning Maureen! I love that big bold flower and the way you've stamped it on the color blocked panels--fabulous! So glad you joined us at The Paper Players! Maureen, stunning. You used the colors in such a visually interesting way. Then, the repetition of the flower was a master class in clean and simple but bold and beautiful. Love it! 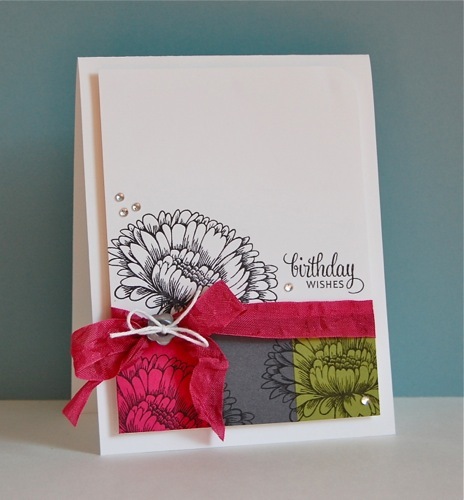 Love the way you used these colours and the flower stamp, gorgeous! This ROCKS!! Love the use of the flowers -- nice take on the sketch~ Thanks for joining in at I Spy Sketches! WOW! Love the colour blocked bottom of the card with that gorgeous flower stamp on it! Thanks so much for playing along with us this week over at iSpy Sketches! Was so busy last week, I didn't have a chance to comment....this is fantastic! Love how you added a touch of color and stamped all those flowers! Bling is perfect!